ABUKAI Blog: Even large enterprises deploy mobile apps...to save money!!! 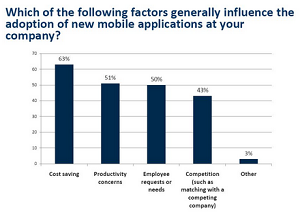 Even large enterprises deploy mobile apps...to save money!!! If you work for a large enterprise and are unsure whether deploying mobile applications like ABUKAI Expenses to improve your productivity is a) something you should do, and b) something you should do now, check out this posting by Eric Lai in his ZDNet Ubermobile blog. He summarizes a study by Kelton Research of companies that generate $100 million or more whether and why they were going to deploy mobile apps this year. 90% said they were (n = 250)! And the main reason to do it? Saving money! Eric comments,"It’s heartening, as it shows that mobilizing appears to be a fiscally sound strategy, not something something with a pie-in-the-sky ROI." He goes on to share that 2/3 (65%) of respondents said they’ll deploy 5 or more mobile apps this year and 21% say they are deploying 20 or more. He further explains how doing so provides these companies a fast, running start towards mobility that will likely help those companies leapfrog their competitors, the same way that e-business separated the innovators from the laggards. Interesting reading for those planning to deploy mobile apps. Perhaps a wake up call for those who are not?